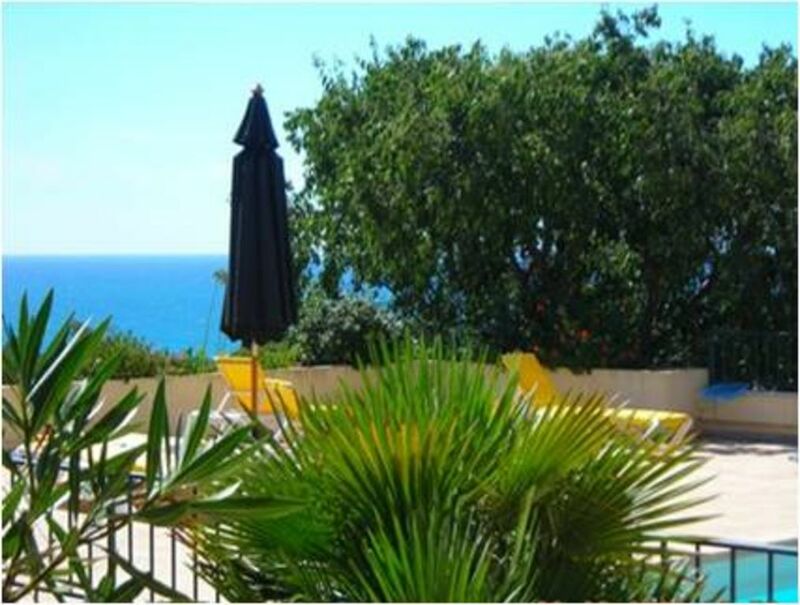 This detached holiday home is in a large charming house on the slopes of Mont Saint Clair, in the valley called "Petit Nice" where growing orange, lemon, grapefruit and other citrus varieties as well protected Mistral. The height sea view located 400 m as the crow flies is a permanent show and changing. The Mediterranean has a large private outdoor area with covered and uncovered terrace, garden furniture, large Weber grill, sink with hot water and electric grill. It gives one level over 2000 m² of lush Mediterranean garden with trees and flowers and the pool of 40 m² with jet stream and unchlorinated water for delicate skin. At the pool, 100 sqm terrace with loungers and parasols welcome you for lounging. Garden and pool are a delight for young and old. A great bowling allows parties fierce even at night. The property is enclosed by walls and opaque automatic gate ensures perfect tranquility. Parking inside the property. 4 Key Clévacances labeled, which means it has been verified as to its condition and quality level by a Herault Tourism technician and therefore you are guaranteed not only that what is offered really exists but is consistent with a quality charter. After various changes of websites, many vacationers appreciations disappeared but you can find them in the guest book located at the end of the section 'About Vonnick Malige'. Close to everything without the drawbacks, the house is located 10-15 minutes walk from the beach and shops, 2 minutes by car. Many leisure activities nearby (see description) Numerous exhibitions paintings, museums, jazz festival, Fiesta Sète, jousting, etc. Several golf courses within a 40 km radius. The bathroom has been completely redone in 2016, it has 2 basins, a walk-in shower, plenty of storage space, a dry towel radiator, an effective VMC. Large fridge with fresh water distribution easy making ice. Many Mediterranean plants and flowers - large walled garden. Large private terraces + 1 solarium of over 100 m² with loungers. Unfortunately not possible given the physical setting. Wonderful landlady. Always available when you want help. Wonderful swimming pool and garden. Fantastisch location. Really quiet and yet very close to the City center. The midges are a problem at night. Thank you for your appreciation, happy that you had a good time here. It is true that mosquitoes this year are much more numerous as everywhere else, probably because of the particular climate we had. We will consider mosquito nets for the next season. We stayed for a week in August 2018. The location is great Sète is beautiful and a 25 min walk away- uphill on way home. Nearest shops a 10 min walk. Beautiful beaches that are very easy to access by car. The apartment was ok, bedrooms a good size. Bathroom with only one separate toilet,kitchen was well equipped . The living area was very small, with 2 chairs and a cushion covered hard shelf area as a sofa. Was not a problem for us as the weather was hot and we were outside most of the time. Was extremely hot, the bedrooms were very hot at night. The owner did provide us with 2 fans but we had to buy another. The outside area was large, an outdoor sofa would have been a great addition. Large area with plenty of sunloungers. Gardens good. Swimming pool was fantastic, clean and very deep for a small pool, however THIS IS NOT A PRIVATE POOL. It is shared by the adjoined apartment which we had not realised when we booked. The pool is only a few feet from the bedroom French doors so could have been very intrusive, we were lucky as the Swiss couple renting the other apartment were very considerate and stayed up the other end of the pool in the mornings when our doors and shutters were open. Would not be suitable for small children. The layout of the Home and Away website is slightly different to the Owners Direct website that we booked through and I think more obvious shared pool, although still listed a private pool. There were no English reviews and you had to hover over the words for a pop up box that clarified . We did not realise that this was not a stand alone villa until contract was sent through, which we did not receive on booking but only when we requested a few weeks before our holiday . Ein wunderbar am Mont St. Clair gelegenes Anwesen mit einem herrlichen Garten. Die Vermieterin ist reizend und gibt einem gerne Tipps für Ausflüge etc. ohne dabei aufdringlich zu sein. Wir haben den Aufenthalt sehr genossen. Ein großes Dankeschön an alle. Ich würde mich freuen, Sie wieder willkommen zu heißen. Nous avons passé une semaine (30/07 - 06/08/16) en famille (couple avec 3 enfants adultes) dans cette magnifique propriété. La propriété est parfaitement bien conçue. Chaque appartement (il y en a 2) est totalement indépendant l'un de l'autre. Le seul équipement commun est la piscine qui est suffisamment grande pour accueillir 2 familles si nécessaire. Cela nous est arrivé très rarement car nous n'avions pas les mêmes horaires que nos voisins. Confort : Chambres spacieuses, salle de bain tout confort, cuisine fonctionnelle et espace télé bien agréable en cas de pluie. Le tout avec des matériaux de qualité. Mais surtout une pergola bien abritée ou nous avons pris tous nos repas. Fabuleux!!!! Accueil: Hôtesse charmante, présente sans être envahissante. A l'écoute et prête à rendre service si elle peut. Attention aux insectes nombreux dans la région. Penser à s'équiper de répulsifs pour avant et d'antihistaminiques pour après.C'est le seul bémol que je trouve. En résumé: un petit coin de paradis dans le quel je retournerai volontiers. La villa se trouve sur le mont St-Clair d'où on a une magnifique vue sur la méditerranée. Elle dispose d'une belle piscine et le jardin est très joliment aménagé. L'intérieur est décoré avec goût et les propriétaires ont fait un effort particulier pour que les locataires trouvent tout ce dont ils pourraient avoir besoin. Nous avons reçu d'excellents conseils concernant les choses à voir et les restaurants à visiter. Nous y retournerons volontiers. Et c'est vraiment avec grand plaisir que nous vous accueillerons à nouveau. Qu'aurait-il fallu pour avoir 5 étoiles, ceci pour améliorer encore dans la mesure du possible. Bonne rentrée à vous . Nous avons passé une semaine en Mai 2016 à 5 personnes dans cette appartement très spacieux, très bien équipé et très reposant. Nous cherchions un appartement avec vu sur mer et proche du centre ville, c’était parfait. C’est vraiment un coin de paradis. Les propriétaires disponibles et discrets sont très sympathiques. J’ai recommandé cet appartement à mes amis. J’espère pouvoir y passer un séjour plus long c’est vraiment trop génial. Nous sommes heureux que vous ayez apprécié les lieux et nous serons ravis de vous revoir un jour ou l'autre. Merci beaucoup. Sète is first the little Venice with its canals which connect the big blue with the Thau lagoon, canals hosting the games, fight for glory sétoise but also, season, canals invaded by fishermen fans ready to fight to catch bream fleshy desire to have eaten in the pond their fill of molds and other dishes royal, do not they say also breams! A tour of the market, there also is the colorful show ... and free! Of course you will be attracted by the stalls of fresh fruit and vegetables picked from around the goat cheese scrublands of the hinterland, fish, pasta, and other tial specialties sétoise kitchen. Do not resist ... we will be happy to explain to you how to prepare your gourmet purchase. You will receive details of strength you forget in the moment, or rather drunk so charmed by singing words! Sète is the Mont Saint Clair which dominates both the city, the sea and the pond of 150 m! Microcosm in itself, inhabited for 100 years about all types of people: aboriginal, some newcomers have been there for 20 or 30 years but will remain forever 'of strangers ...', retirees returning to the country after several decades past in other lands, attracted by the light, peace, love this place so singular, unique on the Languedoc coast. Do not forget to open your nostrils as the Mont Saint Clair is rich with many species which, at night, deliver a range of scents. Stopping a moment in the shelter of a dry stone wall, you probably feel the aroma of pastis served well chilled ... and with a little luck, a MEMEE have prepared a tial 'couffle' of stuffing so secret and so fragrant, macaronade a family that will take you straight to nap. In your dreams, you will find the great Georges Brassens was born and raised in Sete, whose temper is matched only tenderness. And if you're a bit lucid, you can turn the pages of a book by Paul Valéry, another native son who lent his name to the museum overlooking the sea. Let your eyes fly the marine cemetery and now back the words of the poet. There's still so much to say, but know that here, the reality beyond imagination, then a single slogan: abandoned with friends first! 10-15 min walk to the beach and shops, 3 minutes by car. A 5 minute walk, there is a bus to the beach, downtown or the super market. Many leisure activities nearby: beach, water sports, diving, tennis, horse riding, skating, biking, casino, paintings exhibitions, visiting wine cellars (Muscat and others), many museums. Not a dull moment in Sète, many discoveries are offered by the tourist office and we can make suggestions based on personal taste. Airport Béziers / Vias 1 / 2h and 1h Carcassonne (direct links UK). To visit the area: the Canal du Midi and its locks, the vineyards, Pezenas, Carcassonne, the Camargue. NOTE: Beginning in 2014, I gathered my two rental ads which I deleted the notes vacationers previous years. However, you can view their assessments in the guest book located in the 'about Vonnick Malige'. Caution en espèces ou avec un chèque à l'arrivée : 900 euros en haute saison sinon 50% du prix du séjour >> Rendue le jour du départ Le ménage de sortie à 85 € n'est pas obligatoire, vous pouvez l'effectuer mais tout doit être rendu en parfait état de propreté et de rangement comme à l'arrivée (compter un minimum de 4 heures de ménage intensif) - autrement déduit de la caution. Offres spéciales: - Réduction si vous amenez votre linge de maison, de toilette et de piscine (-20 € par personne). - Haute saison : 3 semaines = -300 € - Moyenne saison : 3 semaines =-10% - Basse saison : 4 semaines au prix de 3 N'hésitez pas à me contacter afin de confirmer le prix du séjour et pour toute autre question!